It was a cold and chilly morning here in LA, and I was craving a hot and hearty breakfast. And this tasty Pumpkin Oatmeal Crock pot Recipe really hit the spot! All of the autumn like flavors in this breakfast recipe were just what I was looking for on this winter’s day. This delicious oatmeal recipe is a definite crowd-pleaser that not only tastes fantastic, but is really quite good for you too! It’s also a wonderful vegan or vegetarian recipe. 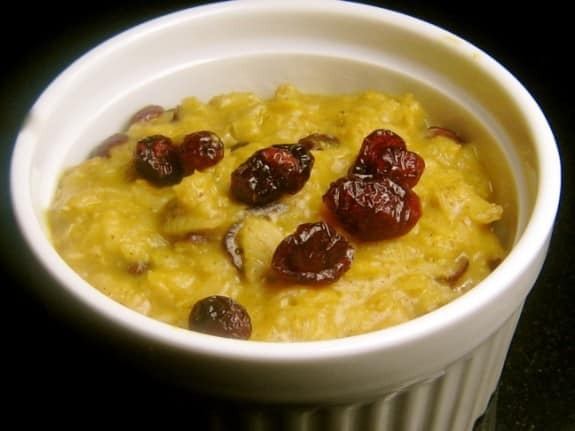 Though this is not an official Weight Watchers breakfast recipe, it’s a wonderful dish for any weight watcher who wants a hot, nutritious slow cooker oatmeal recipe that will warm you up anytime of the year! This filling WW breakfast will leave you feeling satisfied! Start the day with a healthy, no-fuss breakfast recipe that is as delicious as it is satisfying! Thick and hearty oatmeal with seasoned with fall spices. Combine everything in a crock pot, cover and cook on low for 6 hours. Stir well before serving. NOTE: If you use the canned pumpkin instead of the fresh, your oatmeal texture will be creamier and more like a chunky puree. Where are the nutrition facts? This looks amazing! Do you know the points plus value? Unfortunately, I don’t…I need to re-make it and calculate the new Points +! I just made this tonight with a can of pumpkin and the Points Plus Value is still only 3…actually only 2.65, but I thought I’d round up. :) That’s without the dried cranberries, as I don’t have any on hand. Can’t wait to try it in the morning!! Not a fan of oatmeal AT ALL, this was really good, thanks! Pretty yummy! I cut up a peach and added a little splenda and pumpkin pie spice. This is OMG good! I added a touch of ground cloves and a healthy squirt of agave nectar. Tastes the BEST with raisins on top! If you like pumpkin pie filling, you will LOVE this! Just made this last night and YUMMMMM!!!!!! I added a couple squirts of Torani sugar free pumpkin pie flavoring as well as some Torani SF brown sugar cinnamon flavoring. When I served it, I topped it with a 45 calorie box of raisins and OMG it is SOOOOO good!!! Cooked perfectly from 10pm to 9am…didn't scorch in my crock pot. I've got breakfast for the whole week! Ooo…GREAT idea about the raisins and the Torani syrup! This was so good I ate it every day this week for breakfast . I just measured out a cup with a half cup of egg beaters and cooked in the microwave for about three minutes. Threw on some Splenda brown blend and yum yum I counted that as 4 points total. Thank you – what a fantastic recipe. I made this for my coworkers and everyone loved it. I thought I had a can of pumpkin in the pantry and it turned out to be pumpkin pie filling. I opted to use that and leave out the honey and brown sugar and still added in the nutmeg, cinnamon and salt. These changes yielded what I imagined was a slightly spicier version; but, the points were still the same 3 pts/ 1 cup. We all thought the 1/2 cup portion was perfect and it allowed room for some Craisins for a 2 pt. total. Thank you so much for your time and efforts on this site. I am finding everything on here so helpful and tasty. Keep up the good work. Ohhhh this sounds good. I have all the ingredients and I'm going to cook this for breakfast tomorrow mornng. I love oatmeal and pumpkin, can't wait to try this recipe. But like Laura, I'll have to make half the recipe. I wonder if it would work using MULTI GRAIN with MILLED FLAXSEED & SOY Hot Cereal, I'm out of oatmeal at the moment. One thing I would suggest for cooking in your crockpot is use a crockpot liner bag. This definitely saved me on the cleanup side. Also, I know my crockpot cooks hot, so I made sure to have my timer shut off at 5 hours, then I let it set, covered (no peaking!) for the last hour. It turned out so creamy and tender. Make sure you stir the oatmeal well prior to serving, as the oats settle to the bottom during cooking and you want all of the flavors blended when you scoop up that first wonderful bowlful! Sorry this didn't turn out so well for you. :(. If you halve the recipe though, you'll want to lessen the cooking time. Try cutting the cooking time in half too, and see if that works. Hopefully you'll have better luck next time. This soumds so good!! I have a few questions though. Does it reheat well? And does it keep well? In my house its just my husband and me and he doesn't eat pumpkin or oatmeal, so this would be just for me. It reheats well about once or twice, and then it starts to get mushy. Id suggest keeping it no longer than about 2-3 days in the fridge. I really want to try this recipe, it sounds so good!!! Does it reheat well and can I put it in the frige (after cooking of course)? I want to try it, but at my house there is only my husband and me (and he doesn't eat pumpkin or oatmeal, lol). Wow this looks so great! I love pumpkin and oatmeal, so it looks like a win for me. One question, does it reheat well? When did you put it in the pot, in the middle of the night so it would be ready in the morning? Just curious thanks for sharing! Hahahah! Good question!! And yes…I go to bed pretty late, so I put in the crock pot at about 2am. Yum!! That sounds soo good!! I'm going to try it!